A highlight of the 1995/96 pre-season was the visit of Newcastle United, with David Ginola and Les Ferdinand making their debuts, when 4,600 watched the Premiership giants triumph 3-1. A long FA Cup run ended with a home First Round Proper defeat at the hands of Cardiff City. After one or two jitters the season climaxed in May, when 4,664 people, then a ground record, witnessed a 3-2 victory over Merthyr Tydfil to secure the Southern League Championship and a place for Roger Ashby’s side in the Football Conference. That team had included Garry Butterworth, Darren Collins, Graham Benstead, Andy Kirkup and Nick Ashby. 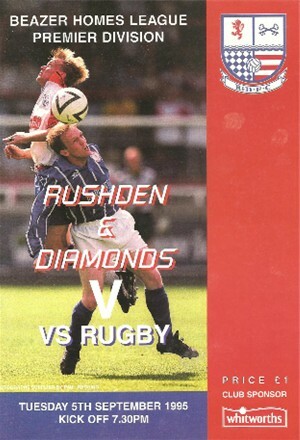 The game at Gresley Rovers on 14th October 1995 was the 200th in the Diamonds History – see here for a reflection on that milestone.